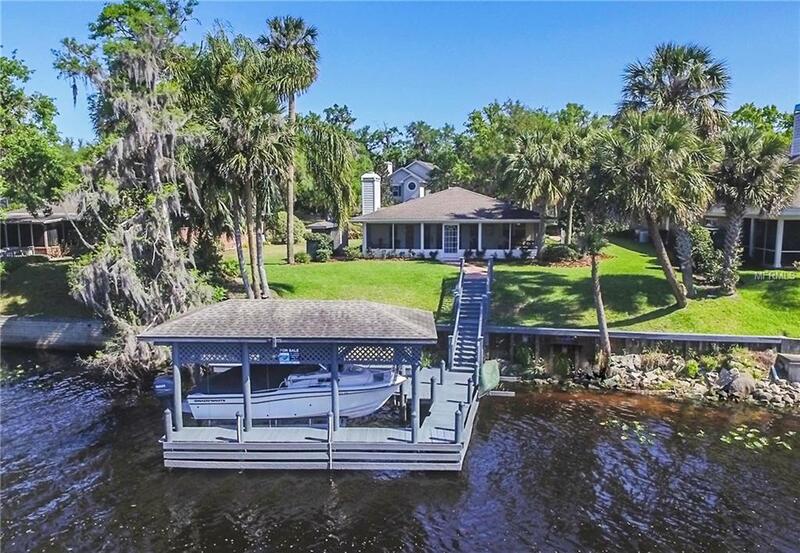 EXQUISITE RIVER-FRONT ON THE ST JOHN'S! Located on the HIGH BLUFF of the MAIN CHANNEL, this magnificent home has been TOTALLY REBUILT (2003-2008) down to slab & studs. From the exterior w/HARDY BOARD & FIBERGLASS DOORS to the SUPERIOR INSULATION in interior walls...from the HINKLEY solid brass fixtures on its ceilings to its HICKORY floating floors, EVERYTHING has been TASTEFULLY SELECTED, MASTERFULLY CRAFTED, DISPLAYING EXCEPTIONAL QUALITY THROUGHOUT! BALDWIN HARDWARE is affixed to SOLID WOOD DOORS hung on CUSTOM CASINGS, accented w/CROWN MOULDING & CHAIR RAILS, finished w/OIL-BASED ENAMEL. The kitchen, RICH CUSTOM CHERRY CABINETRY adorned w/high-end MARBLE-LIKE CORIAN counter tops, opens into an EXPANSIVE, ELEGANT FORMAL DINING area. In the living room, a WOOD-BURNING FIREPLACE (custom GRANITE surround & wooden mantle) along w/a GLASS FRAMED WALL opens w/FRENCH DOORS leading onto the WRAP-AROUND SCREENED LANAI reminding guests that it is all about the river. Extensive OAK CABINETRY ALIGNS BOTH WALLS of the multi-purpose room which serves as an office, pantry, & laundry. Two spacious bedrooms, each w/TWO DOUBLE DOOR CLOSETS & PLANTATION SHUTTERS, provide comfortable retreats w/the master having a PRIVATE EN-SUITE. A THIRD BATH is accessed from the OVER-SIZED GARAGE. With 90-FEET OF RIVER FRONTAGE, the BOATHOUSE (10,000 lb LIFT & ALUMINUM CRADLE) will launch a 26' BOAT into DEEP WATERS charting a course north to Lake George & intracostal waters or south to the port of Sanford. MUST-SEE VIDEO ATTACHED!